Join Camp Sojourner for performances by Philly musicians to benefit our year-round activities! CAMP SOJOURNER, GIRLS’ LEADERSHIP CAMP is a nonprofit leadership program serving Philly girls ages 8-17, offering affordable summer camp and free year-round activities. 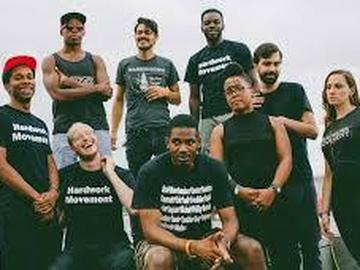 HARDWORK MOVEMENT a Philadelphia based hip-hop group that strives to make music that is inclusive, original, and inspires all listeners to strive towards uniqueness in all that they do. SISTAHS LAYING DOWN HANDS an all female percussive, poetry, storytelling, dance and drumming collective that uses as a healing resource for all. UNIDOS DA FILADELFIA SAMBA GROUP, a community-based samba school whose mission is to spread the joy and excitement of Brazilian percussion. Performance by our very own Sojourners and other special guests! Sojo Groove Night is happening at THE ROTUNDA (4014 Walnut Street) in Philadelphia, a community-gathering place that is fueled by the belief that art is a catalyst for social change. SUGGESTED DONATION $25, with additional donation and discounted tickets available--if you can pay more, please do! Our goal is to raise $3,000 to help launch our year-round programs for Philly girls at no cost to families, including our Teen Leadership Institute, College Prep Squad, Bartram's Garden farm days, self-defense classes, college tours, creative arts, social justice action projects, and more. If you need to pay less than the suggested donation, please do--we want all of our community to be able to attend. FOOD AND RAFFLE will be available at the event, including gift certificates and gift baskets from fabulous local businesses. We hope you can join us on October 12 to enjoy great music, and help provide much needed programs for Philly girls!